I sent this update Saturday but in case you missed it: The California top-two primary is June 3. If you live in California, we need your vote! I’m running for state treasurer and Laura Wells is running for state controller on a public bank platform. If you’re in the Los Angeles area, it would be great to see you at our election night campaign party on Tuesday. It’s at a home in Hollywood near Melrose and Crescent Heights, and space and parking are limited. For the address, time and directions, please RSVP to ellenhbrown@gmail.com. We’ll be discussing how we can get a city-owned bank going in Los Angeles and a state-owned bank going in California. 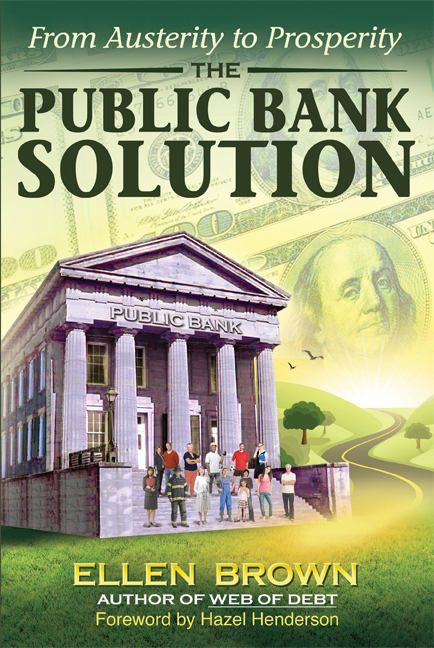 There are two new short public banking videos up on the homepage to my campaign website at http://ellenbrown4treasurer.org. They’re on what a public bank is and why California needs one. Thanks to Rudy Avizius and Ken Walden for that. I did a PowerPoint presentation for Gary Franchi’s Global Freedom Summit, which I had said played last week but actually begins on June 2, running for a week, then is archived. It’s here: http://freedomsummit2014.com/?orid=49119&opid=18. Wednesday on “It’s Our Money” on PRN I’ll be interviewing author and long-time money reformer Tom Greco. We’ll be discussing the new resistance of China, Russia and the BRICS to the global hegemony of the Western political/financial elite. The program will air at noon PST/3 pm EST and can be heard at http://prn.fm/shows/money-ellen-brown/ or in the archives. Unsubscribe sjenkins@utahsenate.org from this list.